A Teacher must continually learn. A Teacher must respond out of a deep respect for children as individuals. The Free University of Ann Arbor was part of a revolutionary movement in education happening across the country. 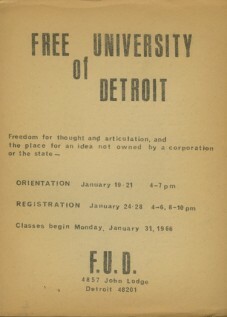 In 1966, the Detroit Artists Workshop would also begin a Free University of Detroit. 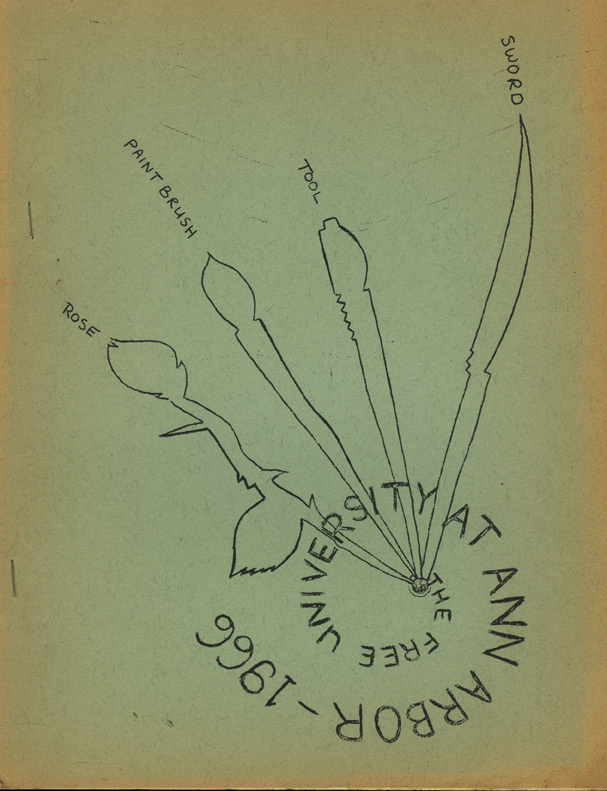 The Ann Arbor Free University was a loose coalition of 30 teachers begun by University of Michigan Professors.Classes included New Jazz with listening classes on Albert Ayler, Don Cherry, Archie Shepp, Ornette Coleman, Eric Dolphy and others.Workshops on Art and Values, Marxism & Art and a Contemporary Music course that focused on John Cage, Stockhausen, and Morton Feldman. Writing studies included classes on William S. Burroughs, Jackson MacLow, Robert Kelly and Jack Spicer. Other courses included; Underground Cinema, Modern Political Economy, Power, Policy, Elites and the Structure of American Society and “Poetry Now?” Classes were discussion oriented rather than lectured and limited to 15 students; “A teacher does not presume to be wiser than the students…” Below the Ann Arbor catalog is an article from the “Collegiate Press service.” from February, 1966, on the phenomenon of Free Universities. Across the country . . . 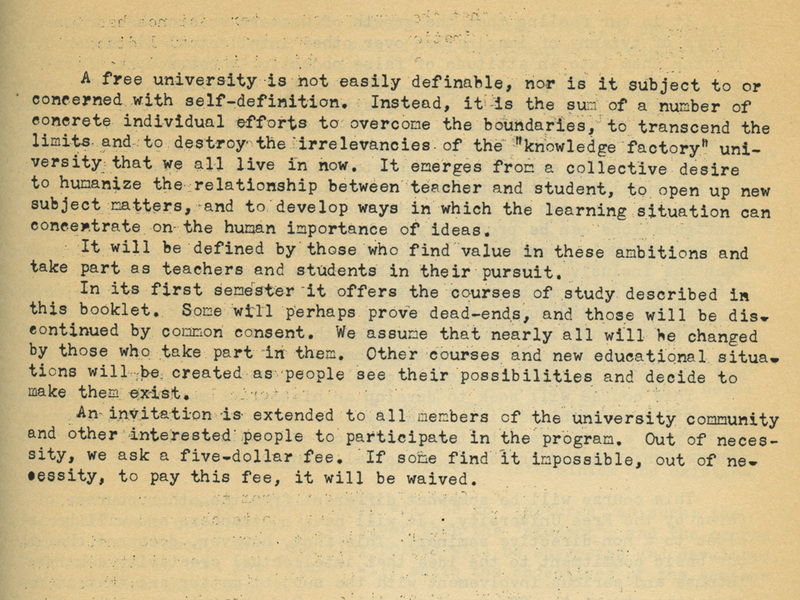 When philosopher Paul Goodman suggested in 1962 that students and teachers secede from their universities and form independent communities of scholars , there was not exactly a rush to begin education’s civil war . Yet three years later, gaining its impetus from the student uprising at the University of California’s Berkeley campus, the free university has become part of the scene near several campuses . In Palo Alto , Gainsville, Ann Arbor and Austin, and perhaps a dozen other centers of higher education , free universities are in swing this year . Since then, free universities have taken roots in New York, Chicago, Los Angeles, and Boulder Colorado. Others are in operation or being planned near many of the nations major universities , including Stanford , Florida , Texas and Michigan. At strife-torn St. John’s University in New York , striking faculty members have started a university in exile to keep students in touch with their regular teachers. Some of the free universities, like San Francisco’s New School, are operated by New Left groups, such as Students for a Democratic Society. Others, like the Free University of New York and the New School of Los Angeles , try to encourage a broad spectrum of radical thought while remaining independent of any specific organization .. The Los Angeles school has accepted $ 1,100 from the Communist Party but claims to be free of all groups . Free university classes usually consist of evening lectures held in college facilities, churches , apartments , coffee shops , or any other facility with four walls and a roof . None of the universities are accredited, none of them grant degrees, and that s the way most of them want it. The three largest at Boulder, Chicago and New York each have about 300 students . Though all the schools plan expansion, total national enrollment at present is about 3,000. Typical is the Free University of New York, whose shabby headquarters are above a Manhattan coffee shop . Policy is set by the students and the faculty. In spite of its name, FUNY charges $ 24 for one course and $ 8 for each additional course so it will not have to rely on any private benefactor. Most of the 46 courses offered are Marxist-oriented . They include Marxist economics, the theory and practice of radical social movements, experimental cinema, and the search for – authentic sexual experience. Other course titles include community organization , literature versus LBJ, 20 th Century theology, the literature of the Vietnam liberation fronts : since 1936 , hallucinogenic drugs, and black ghetto radicalism. Many of the 54 faculty members – like most of the student body – are either full time teachers or students at various colleges and universities in the New York area. The catalog lists only half of the faculty members as having any college degree themselves. FUNY is headed by Dr , Allen Krebs , an Adelphi University sociology professor who was fired for traveling to Cuba in 1964. Other faculty members include James Mellen , a Drew University political science instructor who was fired because of his statements on Vietnam ; Milton Rosen , the chairman of the Progressive Labor Party ; and Levi Laub , a member of the PLP who is under indictment for leading an illegal student trip to Cuba . Staughton Lynd , the Yale assist : ant professor who recently returned from a trip to North Vietnam , and Russell D . Stetler Jr ., an organizer of the May Second Movement who made headlines by showing a Vietcong film at FUNY last spring , are also listed as faculty members. Liberal Periodicals The faculty also includes members of the editorial board of such periodicals as Liberation , International Socialist Review , Studies on the Left , Viet-Report , Minority of One , Free Student , and Spartacist . hTe catalog says that FUNY was organized in response to the intellectual bankruptcy and spiritual emptiness of the American education establishment . Students have been systematically dehumanized , deemed in competent to regulate their own lives , sexually , politically , and academically . They are treated like raw material to be processed for the university s clients â€” business , government , and the . military bureaucracies . College faculties , the catalog claims , are underpaid and constantly subject to investigation and purge. They have been relegated to this position of servant intellectuals, required, for regular promotion, to propagate points of view in harmony with the military and industrial leadership.